Do Sunday circulars make you roll your eyes—or grab the scissors? According to a 2015 survey from CreditCards.com, 63 percent of Americans still prefer using paper coupons to flashing mobile promo codes at the cash register. 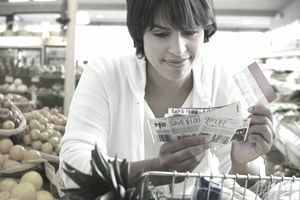 But if coupon clipping brings to mind the antics of TLC’s “Extreme Couponing,” fear not: there are ways to save large percentages without sacrificing a large percent of your time. “The great thing about couponing is that it can scale up or down,” says Joanie Demer, co-founder of TheKrazyCouponLady.com. Here’s how to take a balanced and time-efficient approach. The key to maximizing your savings is to engage in stacking, which means combining a store coupon with a manufacturer's coupon to purchase a single item. Start the old-fashioned way by sitting down with your stores’ circulars and looking for deals that make sense for you. Then head online to search for printable store and manufacturer coupons (you’ll want to search the websites of both) to up the savings. But don’t leave home without the app for your favorite stores on your mobile device, says Stephanie Nelson, founder of CouponMom.com. That will allow you to see if you can combine any other discounts from wherever you are. Here’s an example: Say your local grocery is running a sale on your favorite crackers. Right now, they're on sale: “2 for $4.00.” You head online and find a store coupon for “$0.50 off 2,” as well as a “$0.50 off 1” manufacturer coupon. Since you can use one manufacturer coupon per item, then you can print two manufacturer coupons (one for each box), stack them on the store coupon, and get the two boxes of crackers for a total of $2.50. Just note: There may be limits on the number of the same coupon you’re allowed to use on a single day. It’s typically four, Nelson says, but since it can vary by retailer and manufacturer, ask your store manager what the policy is (or see if it’s posted by the entrance). You can print two coupons per device, says Demer. That means if you have two computers in your house, you can print two of the same coupon, from each device, for four total. Three devices? Six coupons. While there are hundreds of different coupon sources online, the software that tracks who’s downloading what is consistent. Just consider it their effort to keep you from venturing to the extreme. “The only thing that makes me look like a hoarder is Tide [laundry detergent],” says Demer. “I have maybe 20 bottles of Tide.” This is why some couponers can look like hoarders on TV: they buy in bulk when there’s a good sale. If it’s something your family uses often, then why buy for one or two months when you can buy enough for three to six months at 70 percent off? Keep in mind expiration dates, of course—but do it the right way, and you’ll save more money and time by making fewer trips to the store. You may decide that there’s enough value to be had via online coupons and apps that you want to skip the Sunday circulars entirely. But don’t skip the stores! The national stores reset their sales on Sunday, experts explain, making Sunday or Monday the best days to shop. Keep it simple by sticking to one or two stores, specifically your local grocery and drugstore. And unlike your grocery, your drugstore might have an automatic rebate program and store rewards points which you can use to accumulate cash to bring your bill down the next time you’re in the store.